The meta title of your page has a length of 57 characters. Most search engines will truncate meta titles to 70 characters. The meta description of your page has a length of 150 characters. Most search engines will truncate meta descriptions to 160 characters. Your page contains too many H1 tags. H1 tags should re-inforce the intended topic of your page to search engines - too many tags may make the topic less clear, or look like spam tactics. Consider using less than 5 H1 tags. Congratulations! Your webpage is successfully compressed using gzip compression on your code. Your HTML is compressed from 165.94 Kb to 34.33 Kb (79% size savings). This helps ensure a faster loading webpage and improved user experience. Your website loading time is around 5.57 seconds and is over the average loading speed which is 5 seconds. It does not appear that you are caching your pages. Cached pages serve up static html and avoid potentially time consuming queries to your database. It also helps lower server load by up to 80%. Caching most visibly benefits high traffic pages that access a database, but whose content does not change on every page view. Common caching methods include Alternative PHP Cache, Quickcache, and WP Super Cache (for Wordpress sites). Caching mechanisms also typically compress HTML, further reducing page size and load time. - Alternative PHP Cache (APC) is an open source framework which caches data using intermediate PHP code. Most web programmers who are familiar with the PHP programming language can easily set up Alternative PHP Cache for your site. - Quickcache is a lightweight page caching solution which was formerly known as jpcache. Quickcache caches the page output rather than compiling the PHP page, making it a superior version of page caching to the Alternative PHP caching. Quickcache can be quickly downloaded from their website and can reduce your page load time up to 80%. - If you have a Wordpress website, WP Super Cache can be installed within seconds and without no programming knowledge. Some of your webpage's CSS resources are not minified. In order to pass this test you must minify all of your external CSS files. For this task you can use an online CSS minifier like YUI Compressor or cssmin.js. https://bloggerwalk.com/how-start-blog and https://www.bloggerwalk.com/how-start-blog resolve to the same URL. Your webpage is using the canonical link tag. 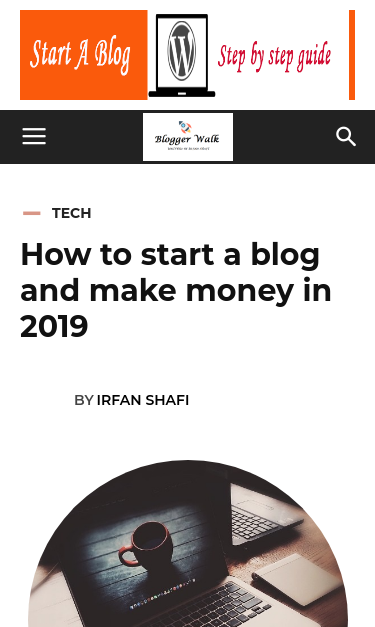 This tag specifies that the URL: https://bloggerwalk.com/how-start-blog is preferred to be used in search results. Please ensure that this specification is correct, as canonical tags are often hard-coded and may not always reflect the latest changes in a site's URL structure. Your DNS server is not using an SPF record. SPF (Sender Policy Framework) allows administrators to specify which hosts are allowed to send mail from a given domain by creating a specific SPF record or TXT record in the Domain Name System (DNS). You can find more information about SPF records here. An SPF record is a type of Domain Name Service (DNS) record that allows email systems to check if the sender of a message comes from a legitimate source and refuse an email if the source is not legitimate. Adding an SPF record is as easy as adding CNAME, MX or A records in your DNS zone. You can find more information here. Before creating the SPF record for your domain, it is important to have access at your domain's DNS zone and to know what mail servers your domain is likely to use and plan how you want any non-authorised email to be handled. Setting an SPF record for your domain can help in reducing the chances of a spammer using your domain name in unsolicited emails. Research carefully what mail servers your domain is likely to use and plan how you want any non-authorised email to be handled.